Birch Shadow Boxes available in SVG - Finally! My file generating the most requests has been one of the very first I designed for the Silhouette store. It was designed for a very specific long skinny wall in my laundry room. It is one of my favorites as well and I finally have transferred it to SVG, pdf and dxf formats. It took a while because my designing skills have improved and I wanted to re-do all of the engineering of this project. The boxes fit together much more closely and I have added the cut numbers to help identifying layers and locations. It makes following the directions much easier. 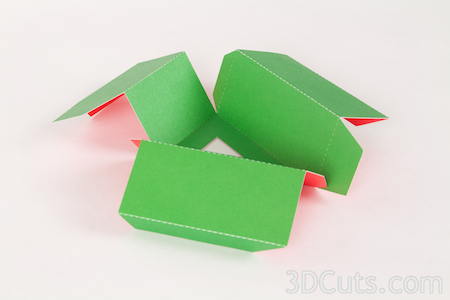 For those of you with no cutting machine - consider this file as one that can be completed by hand cutting. Just use the pdf files. I'd probably have the lines of the tree back come into a straight point but the rest is very easy cutting. It has been a busy design week for me. This was one of those ideas that came to me in the shower, and by mid morning I had my first completed project, and a new concept to boot. And then, by the end of the week I had expanded it to a series of designs plus an eBook! The beauty of this idea is that it works for any word or name. 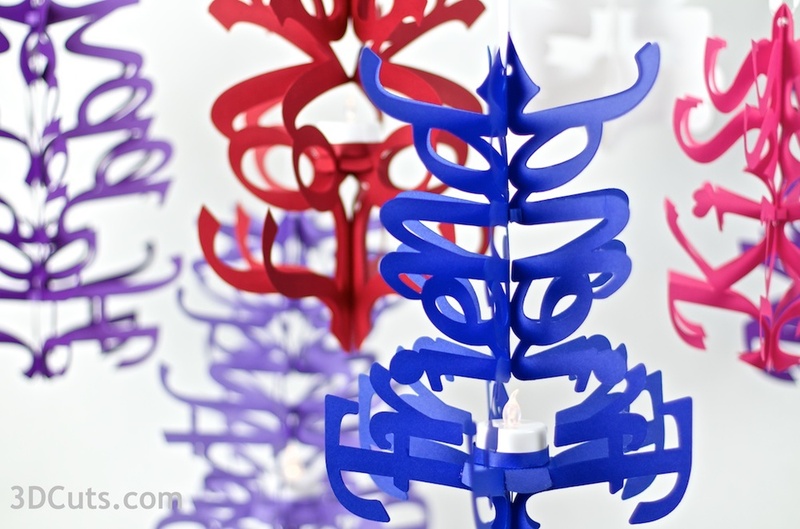 You take that name, make and interesting design with the letters in it, reflect it, weld it and cut 6, The end result is a stunning mobile appropriate for many uses. Because Valentine's Day is approaching, I started with a couple of designs for the holiday, some with LED candles and some without. And one for the best celebration of all - Birthdays! I knew the possibilities were endless, so instead of trying to create them all, I instead wrote an eBook for you so you can do it yourself! 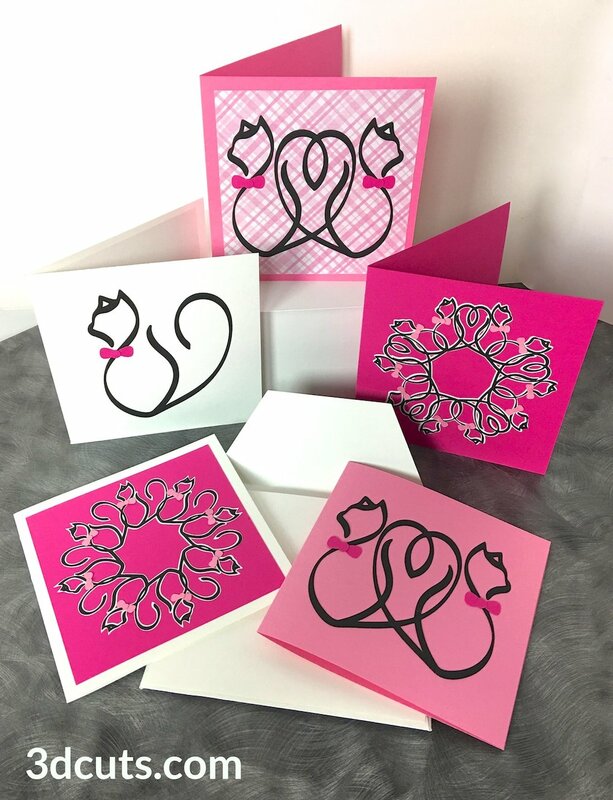 It is a 17 page, step-by-step guide with pictures showing you exactly how to use the Design Studio software for the Silhouette to design your own Calligraphic Word Mobiles! I hope you will try some designs and share them. Send photos! It is no secret I love a design with good graphic elements. Combine that with nifty paper engineering and I am a happy camper. 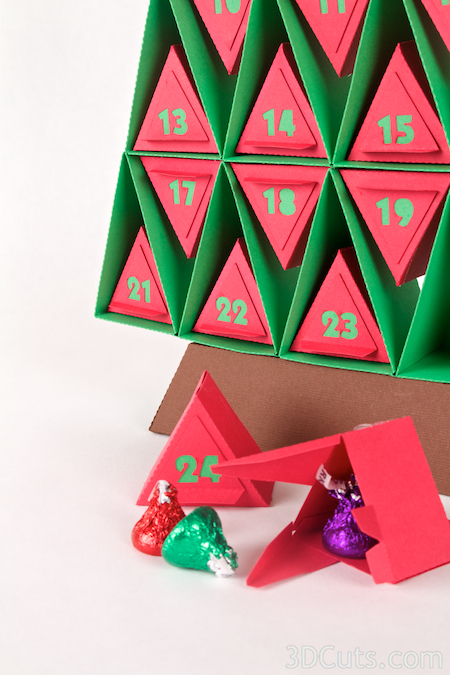 I am very please with my newest design - a variation on the classic Advent Calendar. 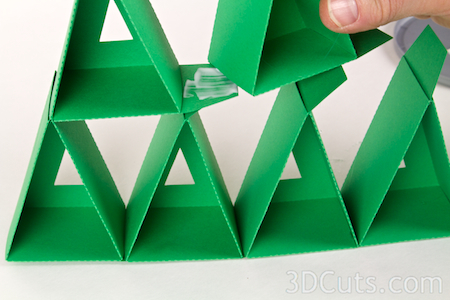 This tree standing 17" tall and is easily constructed of 15 green paper triangle shapes that slide together. Place a small red triangular box filled with a treasure into each space. Start the count down to Christmas on December 1st. The design of this unit makes this an easy project to complete. I have an extensive on line tutorial here with easy-to-follow step by step instructions. 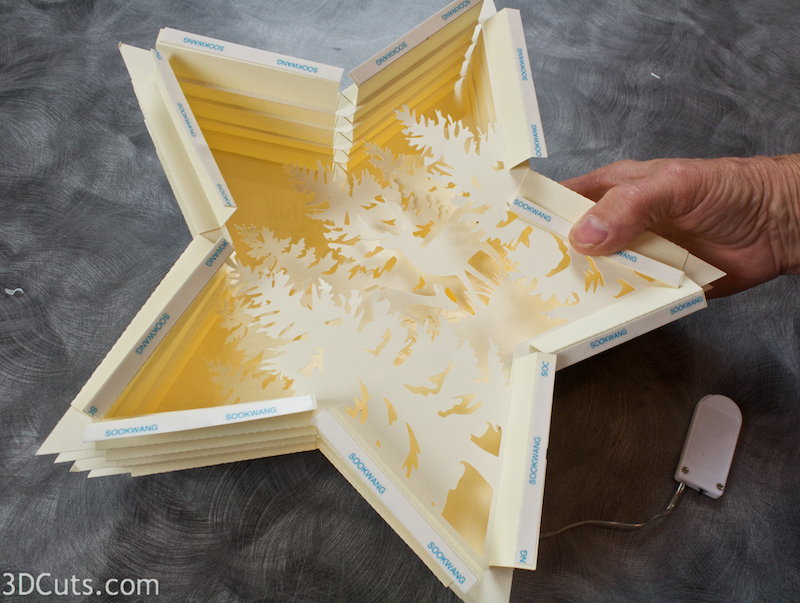 Use your own creativity and paper choices to modify this design. I have made two variations so far! 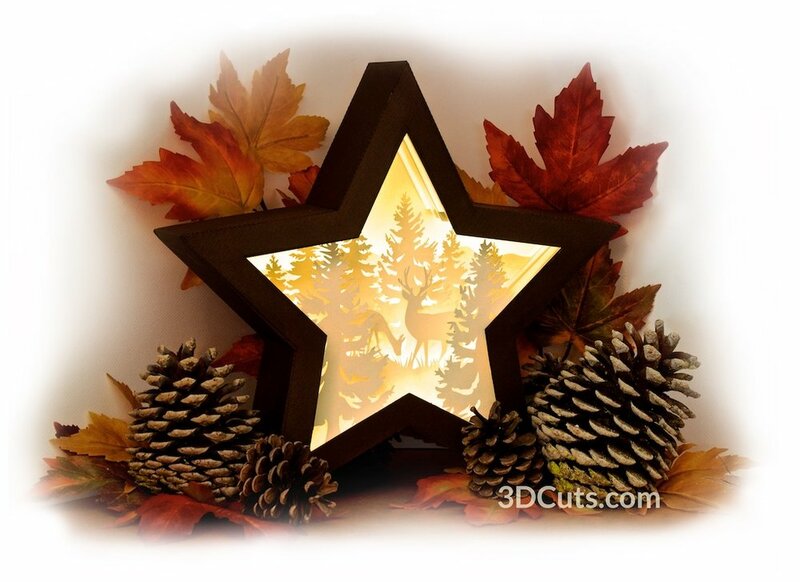 The cutting file is available here at 3dcuts.com. The step-by-step tutorial is online here but also provided in PDF format in the download. Finally, Tea Light Village has expanded. Today I added a Cape Cod style cottage with center chimney and a school house with cupola to the buildings. I also designed a winter maple tree to add variety to the village. All files are available over at the store here. Add standard LED tea lights and watch the village glow warmly with holiday cheer. These tiny buildings are a great way to introduce yourself to 3D files. They are simple to construct and come with complete instructions. After you have created the first set for your home, make more. They make great gifts. The haunted series of Ledge Village buildings and accessories makes a perfect mantle, shelf or Ledge Halloween display. It is small and each part fits on 8.5 x 11" card stock. The mansion is about 6.5" tall and less than 1" deep. The cottage is about 4" tall. This series was first introduced last year on the Silhouette Online store with just the tower mansion, a tree, a bat and a tombstone. This year I have expanded on the series to include a haunted cottage with boarded up windows, a casket that opens to reveal the creepy skeletal remains of some long departed soul, a rickety fence with scary black cat, and a different haunted tree. I keep adding trees to my groupings because they really spark up the Ledge Village displays. I redesigned the mansion to include a few structural changes, more for ease of construction. I also did a better job with the spider web detail on the corner of the porch. I am especially please with the casket and skeleton cutting file. The group of haunted files is available as one download for $3.99 here in my downloads store. There are 4 step-by-step tutorials which you can review before purchase here. And you will find that construction of this project is quick and easy! It won't take from now to Halloween to complete! Have fun making it and be sure to share photos with me.